Four of the issues that President Obama mentioned prominently in his State of the Union address included dealing with the deficit, overhauling immigration policy, pushing through major gun legislation and tackling climate change. Earlier this year, there was significant movement on immigration, with the Senate voting 68-to-32 in June to pass a comprehensive bill that would provide a path to citizenship for immigrants in the U.S. illegally and additional spending to tighten the nation’s borders. The bill always faced tough sledding in the Republican-controlled House, but now, with the challenge of Syria on the front-burner as well as a looming fight over the debt ceiling and other budget issues, further action may be pushed back, if it happens at all. A sizable number of Americans (51%) said in a survey conducted in February that it was “essential” for the president and Congress to act on major immigration this year, while 37% said it was something that could be done in the next few years, and 7% said it should not be done. But even though 75% of the public says current policies need at least major changes, immigration ranks much lower with the public than the deficit as far as the urgency of action this year. 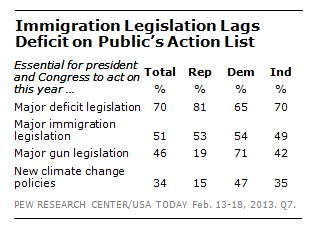 Seven-in-ten Americans said action on the deficit was essential this year. Among Obama’s other State of the Union priorities, less than half of Americans saw major gun legislation or new climate change policies as essential for action by year’s end. The Senate defeated in April a gun control measure that would have expanded background checks. In June, Obama made a major speech announcing measures to control greenhouse gases. However, last month, Obama’s EPA chief, Gina McCarthy, said that the administration might resort to administrative action to achieve its aims in the face of congressional inaction.